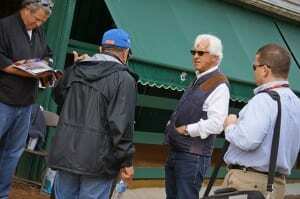 Bob Baffert. Photo by Vas. 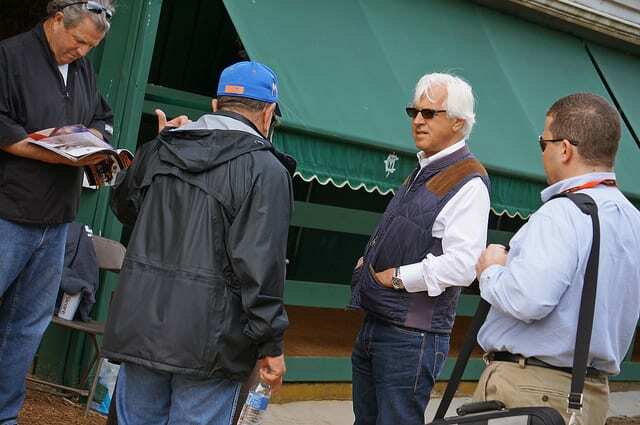 Monmouth Park has honored trainer Bob Baffert with the Virgil “Buddy” Raines Distinguished Achievement Award as Get Serious, a stalwart over the turf course here for years, will join 63 fellow members of the Monmouth Park Hall of Champions. Baffert got his first taste of the Haskell back in 1997 saddling Anet to a runner-up finish. He got his first Haskell winner with Hall of Fame member Point Given in 2001, en route to a record seven wins in the Jersey Shore’s signature race. His other victories came with War Emblem, Roman Ruler, Lookin at Lucky, Coil, Paynter and last year with Breeders’ Cup Classic winner Bayern. The Raines Award was instituted in 1996 to honor men and women who have demonstrated a continuing commitment to the sport of Thoroughbred racing as an owner or trainer, and whose conduct has been exemplary for professionalism, integrity and service to the sport. Each recipient of the award receives a trophy emblematic of the honor. All winners have their name placed on a special plaque that is displayed in the Monmouth Park Clubhouse. Come Opening Day this Saturday, Get Serious will have his banner hoisted in the Monmouth Park Grandstand as the newest member of the Hall of Champions, which honors the best runners ever to compete at the Oceanport racetrack. A maiden winner at second-asking back in 2007, Get Serious began his career on the dirt, but got real serious when he switched over to the turf. The James Dinan, Phantom House Farm color-bearer won three consecutive runnings of the Grade 3 Red Bank Stakes (2009, 2010 and 2012 – the race was not run in 2011). In addition to those three, the gelding by City Zip scored five other stakes victories on Monmouth turf, including graded victories in the Monmouth Stakes and twice in the Oceanport. From a record of 43 starts, Get Serious won 14 races, 13 of them at Monmouth Park. From a career that spanned seven seasons, he earned $1,124,651. The Monmouth Park Hall of the Champions is located on the first floor of the Grandstand.